I’m making up the curriculum for MBA Mondays on the fly. The end game is to lay out how to look a businesses, value it, and invest in it. We started with the time value of money and interest rates, we then talked about the corporate entity. Now I want to talk about how to keep track of the money in a company. That is called accounting. This will be a multi-post effort and will include posts on cash flow, profit and loss, balance sheets, GAAP accounting, audits, and financial statement analysis. But before we can get to those issues, we need to start with the basics of accounting. Accounting is keeping track of the money in a company. It’s critical to keep good books and records for a business, no matter how small it is. I’m not going to lay out exactly how to do that, but I am going to discuss a few important principals. The first important principal is every financial transaction of a company needs to be recorded. This process has been made much easier with the advent of accounting software. For most startups, Quickbooks will do in the beginning. As the company grows, the choice of accounting software will become more complicated, but by then you will have hired a financial team that can make those choices. Advertising revenue that you receive from Google Adsense would be an income account. The salary expense of a developer you hire would be an expense account. Your cash in your bank account would be an asset account. The money you owe on your company credit card would be called “accounts payable” and would be a liability. The concept of double entry accounting is important to understand. Each financial transaction has two sides to it and you need both of them to record the transaction. Let’s go back to that Adsense revenue example. You receive a check in the mail from Google. You deposit the check at the bank. The accounting double entry is you record an increase in the cash asset account on the balance sheet and a corresponding equal increase in the advertising revenue account. When you pay the credit card bill, you would record a decrease in the cash asset account on the balance sheet and a decrease in the “accounts payable” account on the balance sheet. 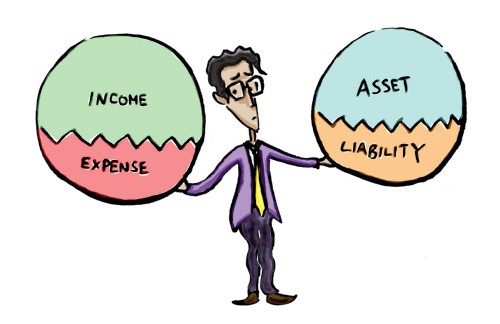 Since the objective of MBA Mondays is not to turn you all into accountants, I’ll stop there, but I hope everyone understands what a chart of accounts and an accounting entry is now. I am a firm believer that all businesspersons have to become 360 degree professionals. We have to be proficient on a great number of things. Accounting is one of those things. This is why you are the boss. When starting out, get a CPA (small shop preferably) to set up your books on QuikBooks. He will already have the software and will undoubtedly have an existing client. This will take him about 15 minutes. Check, doublecheck and re-check the chart of accounts and the work product to be delivered. You need at minimum — general ledger, financial statements (income statement, balance sheet, statement of cash flows), transaction journals (accounts receivable, cash receipts journal, accounts payable, cash disbursements journal, check register), payroll, bank reconciliations, debt reconciliation and a cash account reconciliation (only because cash is so dear). Don’t panic, these documents are all produced by the software. All you have to do is bring him the invoices and he will cut the checks and you will sign the checks. At the startup phase, never, ever, ever, ever delegate check signing to anybody. Feel the cash flowing through your fingers. This is like feeling a big fat Rainbow Trout “mouthing” your fly. It is the difference between landing the big one and well, not landing the big one. For the first few months, have the CPA go over each and every document and explain them to you so you can see the linkages. You are in school now but it will only take an hour a month. In three months you will be an expert. Then, get a bookkeeper or retain a bookkeeping service (small shop w/ lady w/ blue hair who does not smoke and has grandchildren and reminds you of your own grandmother — she will not embezzle from your accounts) and have them enter the transactions and have them reviewed and verified by the CPA on a monthly, quarterly and annual basis. Maintain detailed files while requiring the CPA and bookkeeper to maintain the identical files. As you grow, you will bring the bookkeeping in house and then the “controller” (CPA) function. In this way, you have developed a systematic approach which will be easy to assimilate and which will really change nothing as you grow. You will be growing “smooth”. Last tip — have electronic access to your accounts at all times so you can check which things have been paid, which have not been paid (that’s sometimes how you manage cash flow — not paying on time) and how much cash you have. Distribute the information to your key employees and partners/founders and make damn sure they read it. Overcommunicate. You don’t want anyone to find out they are in a risky business when the first bomb goes off. Make them own the reality of the enterprise. What level of disclosure to employees is appropriate? One startup I was in was damaged severely by the CEO keeping the books secret to himself. Since the books were secret we didn’t know when the company was running out of money, so we kept spending on a growth path. His plan was to raise more money before it ran out. He didn’t make it in time and we ran off a cliff. If we had known how tight the money was we could have adjusted spending. For example we bought a PBX right before we had to lay off a bunch of people. I have been running companies (private and public) for a long, long time. I have heard just about every compensation issue ever raised. I am not better for the experience, mind you, but it has made me adopt a policy which works very well for me. I am not a Communist — though if I had been one I am convinced I would have been a very ruthless and good one. I let everybody know everybody else’s compensation down to the salary, bonus, incentive comp, commissions, extra benefits (cars, vacation) level. Anybody can go to accounting and get the info at their own volition. They often do. It saves a whole lot of problems in the long run and it keeps you on your toes. It makes you defend your own decisions and it makes you intellectually rise to the level of being perfectly rational. It also sparks a dialogue from time to time that needs to be sparked. It also smokes out any bubbling personal discontent. You don’t want bubbling discontent. Lance the damn boil and deal with it in real time. I once told a fellow who worked for me — who was very good but lazy as a dog — that he “could not hold another person’s jock”. He was mightily offended. I told him — “show me otherwise”. He did and I increased his compensation. I only do and recommend stuff — even when it seems a bit weird and against my sometimes elitist instincts — because I know it works. Everybody gets revealed and everyone can get all the info from the receptionist to the CEO. As CEO, I often don’t remember what folks get paid nor do I particularly care. I always tell folks I am resposible for managing the company and they are responsible for managing their own careers. The first time I tell them that, they get a funny look on their faces. Then they get it. I am in the opportunity business not the fulfillment business. I never really think about it until we make a bunch of money, then I give healthy bonuses — stock or cash. To everybody. I am also very keen to make “tailor” made solutions. You have kids getting ready to go to college, I will dream up a college scholarship program. You are going to grad school at night, I will dream up a tuition reimbursement program — only if you make “A’s”. I make it up as I go and I don’t particularly worry about anything except SEC considerations. I try to end up w/ a system wherein if the folks do well, I do very, very, very well. Has never failed me yet. I have people who follow me from deal to deal because they know I will share the wealth. The greatest honor ever bestowed upon me in business is the high quality of folks who have invested their lives and confidence in me. It is really awe inspiring and I truly do not deserve it. It is the only real impediment to my working remotely from the mountains and Mexico 12 months of the year. And along the way, I have a whole lot of damn fun. But I digress, sorry. This post was originally written by Fred Wilson on March 8, 2010 here.